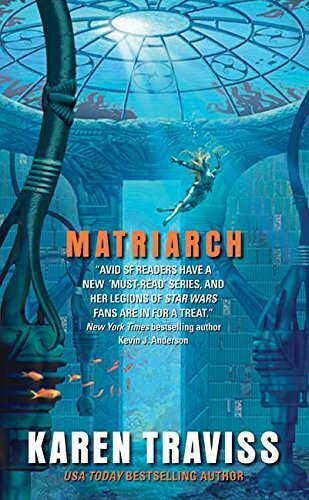 Matriarch is the fourth book in Karen Traviss's highly successful Wess'har War Series, which also includes City of Pearl (2004), Crossing the Line (2004), and The World Before (2005). The first three books were originally intended as a trilogy, but their success and Traviss's prolific imagination quickly lead to the expansion of the series to six books, with plans already in the works to publish Ally in the spring of 2007 and Judge in the fall. The first three books in the series were rightfully praised for their engaging and complex characters, their fast-paced and compelling plots, and their skill at turning the familiar tropes of science fiction—alien invaders, space wars, immortality, and distant colonization—inside out, revitalizing what had become some well-worn terrain. Matriarch establishes that the rapid pace at which Traviss is able to produce novels does nothing to diminish their power, and readers already familiar with her work will welcome this next installment in the storyline. The Wess'har War Series centers on Shan Frankland, an Environmental Hazard Enforcement Officer, who ends up exiled far from Earth on the planet Cavanagh's Star (called Bezer'ej by the local inhabitants) investigating what happened to a long-lost colony whose database of Earth-life DNA has become an important resource in a time of environmental crisis and mass species extinctions. The first three books in the series focus on Shan's role negotiating among competing claims to the planet: the squid-like berezi are threatened by the pollution caused by the territorial expansion of the isenj, while the dominant wess'har try to police the situation according to their strict interpretation of balance among species. The major conflict in these novels emerges from the incompatibility between human values of accumulation and hierarchy and wess'har values of harmony and balance. By wess'har standards, all living things count as people, and common human practices such as meat-eating and experimentation on "lesser" life-forms discovered on the new planet appear horrific. Humans play a major role in this conflict, thanks to their attempts to secure for themselves the c'naatat virus, which renders those infected close to immortal by conferring the ability to survive in any environment and recover from almost any injury. In the climax of the first trilogy, a nuclear weapon is detonated, destroying much of the environment in a disputed territory and all but wiping out the berezi species. According to wess'har justice systems, this destruction must be judged by those from the wess'har home planet, the Eqbas Vorhi, and they will judge not only the individual humans responsible for the destruction but also the planet Earth itself. Matriarch opens in the aftermath of this conflict, and its major themes are punishment, responsibility, and justifiable intervention. Unlike the wess'har, who do not believe in enacting extreme measures to ensure environmental viability and balance, the Eqbas will intervene in drastic ways, culling populations and taking whatever other steps they feel necessary, if invited to do so by a suffering species. The main plot of Matriarch concerns the moral issues opened up by the intervention of the Eqbas on Bezer'ej; in the background to this action is the concern that the Eqbas have also been invited to Earth by the Australian government, representing Indigenous Peoples's interests. As the novel unfolds, it becomes increasingly clear that when it is Earth's turn to be judged, our own political categories of race or nation will be irrelevant. Instead, the Eqbas are concerned only with restoring equilibrium among species, and humans (or any dominant species) do not have any particular special standing in their calculations. Further, to the degree that the Eqbas do distinguish among those of a single species, their sole criterion for preferential treatment is willingness to change and cooperate with the new ecological order, never one's membership in a particular nation or government or race. Karen Traviss has been compared to figures such as Le Guin and C.J. Cherryh for her ability to create convincing alien cultures and to examine the complications of relationships—political and personal—across such vast difference. Her concern with environmental issues, the politics of species difference, and the destructive tendencies of human acquisitiveness and aggression also link her to writers such as Sheri Tepper and Kim Stanley Robinson. Like Tepper, she refuses to grant humans a special place in the "natural" order and is adept at narrating humans from the "outside," showing us how we might look to a species with alien concepts of justice, one who has no particular reason to believe in the myth of human exceptionalism. Both Tepper and Traviss are a welcome breath of fresh air in a genre that can sometimes feel like an endless series of tales about how aliens only "truly" discovered courage, or fortitude, or "spirit," or whatever cliché you'd like to insert when they encountered the example of humans. Unlike Tepper, however, Traviss doesn't tend toward the sentimental or the spiritual. Her characters confront head-on the difficult moral choices that result when one acknowledges the sentience of other species and recognizes that the world is a complicated set of social relations among species, not a resource for human needs. While Tepper's books tend to conclude with some sort of abstract enlightenment which may lead to a better world, Traviss's work remains firmly entrenched in material, political struggle, and conflicts are resolved only through painful compromise and often sacrifice. The trajectory of the plot in Matriarch suggests that while the first three books of the series were concerned with the moral and political dilemmas created by the struggle between the various species on Bezer'ej, the last three books of the series will be focused much more directly on Earth. This book seems to mark a turning point toward dealing much more explicitly with the environmental struggles of our present age, still displaced into the future but no longer displaced to a distant planet. The focus on Earth is still largely in the background in this novel, but one is constantly reminded of the fact that the Eqbas are going to Earth soon—by the reactions of human characters to the political events on Bezer'ej and also by the communications between Earth and Eqbas representatives. More fully than the early novels, Matriarch thus reveals the similarities between Traviss and Kim Stanley Robinson, another author focused on the environment and the devastating consequences of human greed. Both writers understand the political machinations which often stand in the way of sensible environmental policy, and both typically engage with a large cast of characters representing many different factions and perspectives as they tell their tales. Unlike Robinson (or any of the other writers mentioned above), however, Traviss is also a strong writer of military SF, rivaling figures such as David Weber. Her main human characters all come from a military or police background, and much of the human drama in the books is driven by struggles over military strategy or battles regarding dominance and hierarchy. Traviss thus demonstrates a rare combination of SF writer traits: she is equally adept at exciting space adventure, stimulating moral themes, and complex intellectual content. The many virtues of the Wess'har War Series and Traviss's writing are all present in Matriarch , but as the content of this review has suggested, the novel itself is best read as part of the developing series rather than as a stand-alone novel. Much of the story's narrative is driven by the complex character dynamics inherited from the previous books, and in particular by the relationship between Shan and her two partners—both of whom, like Shan, are infected with c'naatat —as they try to find a way to live with this burden of an infectious and potentially dangerous immortality. The virus, it transpires, also blends the genes of all those it has encountered into the new host. Among other things this results in shared memories, exploding the notion of the species boundary, not to mention complicating the idea of autonomous and isolated subjectivity. Traviss is adept at creating difficult and ambiguous characters, none of whom are without flaw, and most of whom act from principle and do what they think is "best" in a world where these "bests" are continually in conflict. The moral dilemmas with which she confronts her characters truly do not have "right" solutions, and Traviss never shies away from showing the detriment as well as the benefit of any course of action. In the context of Matriarch considered on its own, however, this quality might not be apparent, and readers unfamiliar with the earlier events of the series and the intricate interpersonal dynamics they developed might find this current novel impenetrable. The novel also suffers a bit from what is usually the fate of "middle novels" in a series in that it is clearly a way of moving the reader from the concerns of the first trilogy to the concerns of the second (such as the focus on Earth described above). The isenj themselves are almost absent as characters in the novel, which at times seems a bit odd given that much of the major action concerns their fate as a species. Instead, the narrative emphasis remains on the anticipation that Earth is next for ecological ‘re-education' and further on the moral struggle about the c'naatat virus and whether an organism that conveys such limitless adaptability and longevity has any place in a balanced ecological order. Matriarch ends with a cliffhanger, which is inevitably frustrating, but at least Traviss's prolific pace means that we won't have to wait long for the next installment. Any weaknesses of this novel are the result of its inextricable connection to the books that preceded it, and so I would encourage any readers interested in Traviss's themes to begin with the first book and follow the story as it unfolds. The Wess'har War Series revitalizes the tropes of military space adventure and alien encounter, and uniquely marries environmental themes with an action-packed story. Traviss's is an exciting new voice in science fiction and the reader will be well-rewarded for the time spent reading the earlier books before turning to this one. Sherryl Vint is an Assistant Professor at St. Francis Xavier University. She is currently working on a project about the intersections of science studies and science fiction.